Are business schools good for business? Gerhard Apfelthaler, Dean, Educator, Entrepreneur and Author talks with host Mark Sylvester about education, the startup economy in Ventura County and his interesting path to being the Dean of the School of Management at California Lutheran University. 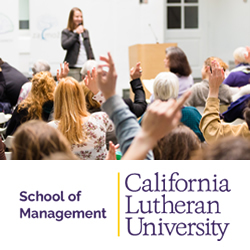 Gerhard has been leading the efforts to propel Cal Lutheran into an internationally acclaimed business school. He tells the story of starting a College in Austria, moving to the US and eventually designing courses that have brought the Cal Lutheran curricula back to Austria. He’s spent time as a Trade Minister and believes strongly that being an entrepreneur is a mindset and a workflow: Taking Ideas To Marketability. He doesn’t believe that entrepreneurs are limited to tech-savvy-high-growth phenoms and instead have expanded into more general business environments. The talk travels many topics, much like Gerhard has travelled the world. This is one guy you’ll want to know much better.